I came across Cambria last October at the Voiles de St. Tropez, among dozens of yachts struggling hard with only a few knots of air towards the windward mark, off the Pampelonne beaches. It is so rare to find these splendid boats all together, and so depressing to see them with their mainsails flapping and the crews to leeward. Then the miracle: eight, ten, fifteen knots, the sails fill, the boats heel over, the sea froths and the fleet comes back to life. Cambria lowers her jib top - the toerail in the water delights only the photographers! - and leaps silently ahead with the grace and efficiency of a sword blade, as these streamlined Fife boats do so well. A brief overlap at the mark, terse commands from the skipper and the whiter than white cathedral of the MPS flies up. Accompanied by the swishing of the bow wave, the great cutter moves away, leaving them all behind, the fantastical vision of an ancient ghost that is called up then immediately vanishes. 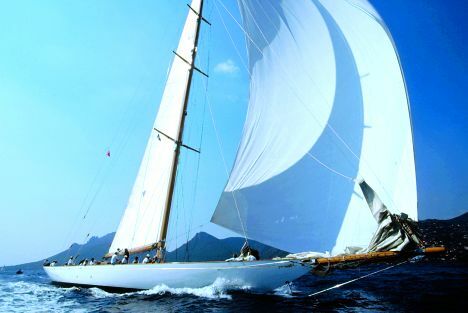 When her first owner, Sir William Berry, decided to join the elite of sailing in 1927, the Big Classes were dominated by Britannia, George V's royal yacht. The choice of designers ranged from C. E. Nicholson and Alfred Mylne to William Fife, a Scot, and the great racers were evolving for the umpteenth time, with all the related rating problems. Bermudan rigs were supplanting the infinitely more romantic but less efficient gaff rigs, and to further complicate matters the new Big Boats were also being constructed in compliance with International Rating parameters which, subdivided into various classes, indicated in metric units the result of a very precise tonnage formula, and certainly not the length of the hull. Cambria, entrusted to William Fife's magic pencil, and Astra, designed by Camper & Nicholson, were 23 m I.R. In 1928, after Fife's victory in the debut race, a series of attempts were made to overcome the heavy handicaps imposed by the new regulations, especially regarding mast height, indispensable to the Marconi rig. A return to gaff rig was even suggested for the cutter, the scene still being dominated by the old gaff-rigged yachts whose names are now legendary: Britannia, Lulworth, Shamrock, White Heather and Westward. A subsequent trend inversion saw even the king transform the Britannia into Bermudan rig, but by then a further, final fragmentation of the class had appeared on the horizon: the J Class which with Shamrock V had Sir Thomas Lipton dreaming in vain of a return to England of the America's Cup. With her brief competitive life over, Cambria was sold in 1934 to Sir Robert McAlpine and her name changed to Lillias. With the owner's death in 1936 she was bought by H.F. Giraud and moved to Turkey. The noble racer became a cruise yacht, based in Ilicia off Cesme, near Izmir, and long sailed the eastern Mediterranean with the Ottoman jet set aboard. Regular guests in those days were Shah Reza, king Fiesel and Kemal Mustafa Ataturk, the creator of modern Turkey. Savarona, the presidential yacht, was often to be seen rocking at anchor alongside Lillias. After the 60's and a couple of Belgian owners the boat was acquired by the American Michael Sears who set out on a circumnavigation that was interrupted in the Canaries by dismasting and then resumed after refitting by Spencer of Cowes, this time with ketch rig. Reefing a single 390 square metre mainsail in an ocean storm did, in effect, create problems. The yacht ended up in Townsville Australia, in the Great Barrier Reef area. Discovered in 1994 by the Australian Prime Minister Paul Keating, the lines of Fife's design and the vessel's history immediately seduced three yachtsmen of great fame: John David, Denis ÒNeil and Iain Murray, the latter the designer of America's cuppers (Kookaburra I etc). The challenging restoration undertaken by the Norman Wright boatyards in Brisbane, Eastern Australia, perfectly achieved the declared objective of philologically returning the vessel to her original appearance while maintaining high standards of safety and sailing efficiency. 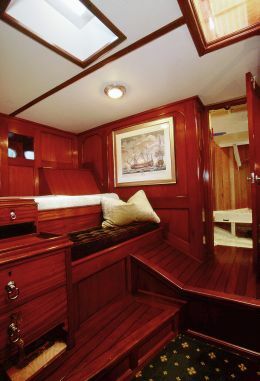 Under the supervision of Iain Murray the Honduras mahogany skin was restored, several planks having to be replaced together with numerous steel frames, while the entire hull was fixed with 6000 stainless steel rivets. The engine, a Cummins 300 HP installed four years after launching (racers never carried excess weight), was reconditioned and the teak deck replaced. 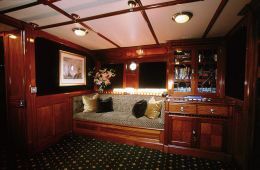 Complete dismantling of the interior revealed that the mahogany had survived in excellent condition: 85% was reused, faithfully following the original layout, the only concession being an extra cabin in place of the large private suite created for Sir William Berry. On deck, seven discreet winches (back then there were a dozen paid hands to do their work) mean she can be raced with a crew of only nineteen. 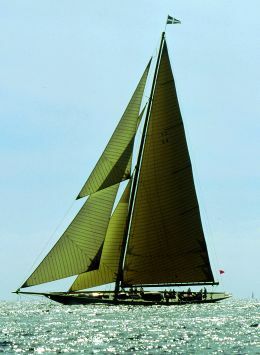 Not only her name but also her rig returned to the origins: the conversion from ketch to cutter, begun in Australia, was completed in Cowes by that same Spencer who in 1975 had doubled the sail area. 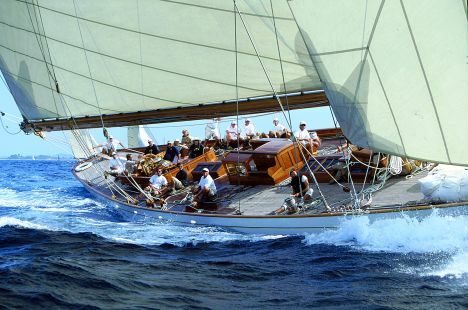 After participating in the America's Cup Jubilee in 2001, together with the elite of the world's most beautiful yachts, a spellbound "Cambria" followed the classic racing circuit and then settled on the French Riviera. From here John David, now the sole owner, sails throughout the Mediterranean, in the wake of the young cutter's early voyages between Greece and Turkey, and calls on her old acquaintances. Moored in the roadstead of Khios, she was recognised by the islanders: it was one of the Lillias' favourite anchorages. 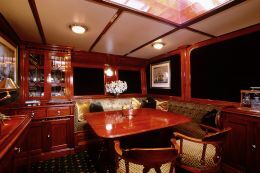 The interior, very elegant with shiny mahogany, fine velvets and button tufted leather, provides four cabins for eight lucky guests who can relive the atmosphere of 30's style yachting. When under way the choice is between following the race on deck or from the doghouse, or conversing in the mess, discussing skipper Pete Mandin's tactical decisions. Cambria, notwithstanding the sporty look confirmed by her racing results, is not above participating in society frivolities such as the various "concours d'elegance" and "concours de sympathie" at the festive gatherings on the C“te where she hoists the burgee of the Monaco Y.C to which she currently belongs.